As you know, attending college is a substantive investment of time and resources. It is an investment of your time and your resources. Factoring in all variables, third party research indicates that attending college is well worth the investment. Case in point, the National Postsecondary Student Aid Study suggests the value-added income from a college degree is approximately fifteen times the magnitude the present value of debt. To further illustrate the point, students earning a bachelor's degree from an accredited institution will, on average, earn in excess of one million dollars more than their peers that hold only a high school diploma. Meanwhile, a student with an associate’s degree will earn $360,000 more than an individual with a high school diploma per a recent study by The White House. In other words, the median full-year, full-time person with a bachelor's degree over 25 years old will earn seventy percent more than a peer with a high school diploma. The United States agency, Bureau of Labor Statistics, produces yearly data on vocations an industries of all types. A recent survey pegs a high correlation between education, income, and job stability. 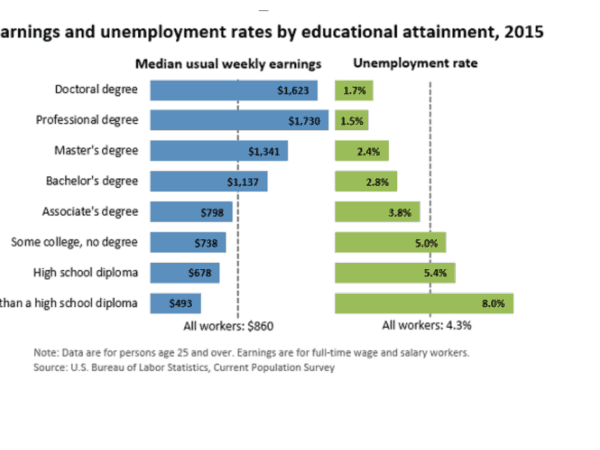 By reviewing the attached BLS graph, you can readily ascertain that the greater level of education yields greater income and higher job stability on average. This telling data is an immense motivation for students and working adults to earn a degree and upskill regardless of their employment tenure. Additional research performed by Georgetown University provides key insights into the value of a college degree. In the GU study, nearly 99% of all new jobs created since 2010 in the United States went to people who had earned a college degree. Trust the data as the preponderance of evidence is substantial. To determine if earning a college degree online is a quality investment of your money and time, simply read on. Your initial goal in online learning will be finding the right fit. Optimal fit may include factors such as program availability, accessibility, accreditation, and cost. In fact, with tuition being the single largest line-item on the list it can be big item. Given the gravity of the decision, you will need to invest time researching schools. Instead of relying upon a friends suggestion or a magazine article, dive into what online school can offer you and collect the right information. Finding a great online college fit starts with you and your priorities. Develop a detailed priority list and overlay those criteria with offerings from prospective online college programs. Digital libraries such as MatchCollege are not all constructed the same. In fact, many niche providers provide a handful of degree programs with a dozen sponsored schools. On the other hand, MatchCollege provides detailed information on nearly 8,000 accredited universities and colleges in the United States. Profiles for schools include accreditation, degree programs, virtual tours, and admissions access to gather information. Students will frequently start by reading our College Admissions Guidebook to start this multi-varied process. Earning a college grants can be an immensely beneficial path for you to reduce the net cost of an online degree. Unlike a student loan, a grant does not come with repayment terms. Grants are a financial aid tool that does not need to be repaid. College grants are offered by entities such as state agencies, federal agencies, corporations, colleges, and non-profit organizations. A study performed by The White House’s delved deep into data about higher education. The broad-based study on higher education revealed that Pell Grants were the largest form of financial aid for students attending college. The study showed the average Pell Grant was for approximately three-thousand seven hundred dollars. With over 8 million students benefiting from this type of grant, the net benefit to college students is nearly $3 billion dollars a year. Further research shows the US government funding for Pell Grants swelled by $12 billion from 2008 to 2014. This net increase of Pell Grants was a 67% bump with awards increasing in size by nearly a thousand dollars per student per year. How can you benefit from the grants available for college? Ask the college financial aid department and your school counselor to help unearth all grant programs. You may be provided with resources such as a Pell Grant for Accelerated Completion and the On-Track Pell Bonus if you meet specific criteria. Like grants, scholarships are a great financial tool you may be able to leverage to help pay for your online college program that do not need to be repaid. With over thirty thousand different scholarships available to students, you will need to do your research and apply for the best scholarships available. Some scholarships are state-based, regionally restricted, based on your ethnicity, academically focused, based on your athleticism, and school-based. Do your research and determine which scholarships are best for you after determining the best online college program. What is the America Opportunity Tax Credit (AOTC)? The AOTC is a tax credit that was created at the federal government level for low-income and middle-income families to help mitigate the cost of higher education. The AOTC provides for a maximum tax credit up to $10,000 over four years’ time for qualifying families and has been expanded five-fold in the past 4 years. Have you heard of the acronym FAFSA? Parents and prospective college students should get to know the FAFSA. It stands for Free Application for Federal Student Aid and is a national tool used to determine college financial aid. With recent changes made to the FAFSA form, you may benefit from substantive financial aid options to help pay for your online college. If questions exist about how to complete a FAFSA, you can connect with your tax advisor or by calling the FAFSA customer service team through their help portal. A FAFSA application is utilized by millions of students every year and a valuable arrow in your financial aid quiver. After all grant and scholarship opportunities are exercised, a low cost federal loan for students may be the tool needed to bridge the final gap. CLEP tests are an abbreviation that stands for College Level Examination Program. A CLEP test is designed to assess your knowledge in a defined subject area. Work experience, prior schoolwork, and/or life experience may help you pass a CLEP test in specific areas of study. These computer-based exams can range from topics such as business administration and English composition to American history and mathematics. Passing a CLEP test can, in fact, save you time and money if you are able to skip a class and earn college credits instead of retaking the material. Why Test Out of a Class and Challenge Exams? Similar to a CLEP test, many colleges provide the opportunity to test out of entire class after successful completion of an authorized assessment or examination. If you happen to be an expert in a particular subject, ask your college counselor if they offer the ability to test out of a class to save money and time on your path towards earning a college degree. Likewise, students may be able to leverage demonstrable competence with a challenge examination. A challenge exam can demonstrate to a university the ability you possess in a subject area and may be able to receive credit for that knowledge versus sitting through a redundant college course. Given the fact that every college may handle assessments, you will need to ask specific questions to gain entrance into challenge exams and knowledge assessments. Have you ever heard of ACE? The ACE organization stands for the American Council on Education and provides students and higher education institutions with a nationwide exam platform. By completing specific coursework through the American Council on Education, you can earn credits to be used towards a degree. The ACE portal was created to link workplace learning with colleges via a standardized examination platform. Former or current United States Military members may be able to utilize the DANTES program. The acronym DANTES stands for Defense Activity for Non-Traditional Education Support. To learn more about DANTES eligibility requirements, students can can visit their website. DANTES was founded to assist military members earn college credits by demonstrating competence in defined subject areas. In turn, participating colleges allow DSST credits of DANTES exams to replace classroom time in college. To register for a DANTES examination, simply complete the application if you believe you have the latent knowledge to bypass a course. Utilizing a referral as your only form of financial aid is a bit shortsighted. However, if you receive a referral from a friend or family member to apply at a specific college a discount may be in order. While referral discounts may not be a large financial aid windfall, every little bit will help reduce costs. Find out if colleges on your short-list accept referrals by obtaining admissions information from MatchCollege or directly through the school. Another lever to assess is the cost of textbooks. Saving money by renting college textbooks or with third-party providers may be worth the time. It may be worth renting or buying text books from online providers such as Chegg, TextBooks, BookByte, Amazon, and VitalSource. Meanwhile, some colleges include the cost of textbooks with tuition as a package deal. Dollar for dollar, the best decision for you will take a little leg-work and organization. College savings plans can be found in many forms. The two most popular include the Coverdale ESA and 529 Savings Plan. A 529 Savings Plan gives you the ability to contribute to a college savings program that grows tax free. Students must use funds with costs directly associated with college or be forced to pay a tax penalty. A 529 plan is offered in most states as either a college savings plan or prepaid plan. A Coverdale Education Savings Account is a different animal altogether. Basically a Coverdale account is a custodial account or trust account that can utilized for authorized pre-college expenses and college expenditures.